He played the Australia Test series without any bat sponsors. 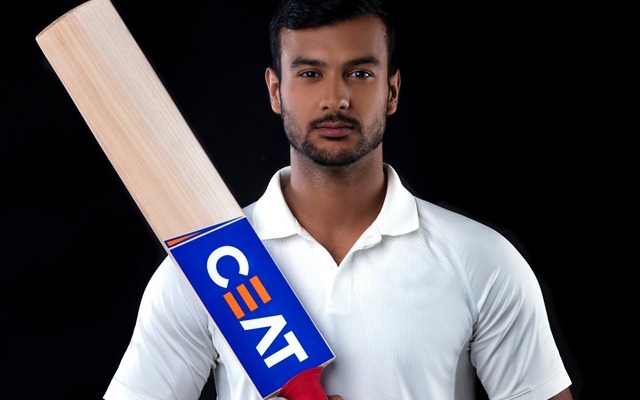 CEAT Ltd. today announced its association with Mayank Agarwal, an upcoming batsman for India. This endorsement makes Mayank a valuable addition to team CEAT, which also has the likes of Rohit Sharma, Ajinkya Rahane, Ishan Kishan, Shubman Gill and Harmanpreet Kaur. He will now be seen playing with a CEAT bat in all formats of the game. Mayank recently made a dream Test debut against Australia during the Border – Gavaskar Series on Boxing Day, 26 December 2018. He went on to score 76 runs in his first innings of the match, which was the highest score by an Indian cricketer on Test debut in Australia. Commenting on the endorsement, Mr Anant Goenka, MD, CEAT Limited, said, “We are glad to bring on board the extremely talented cricketer, Mayank Agarwal to represent the CEAT brand. At CEAT we strive to identify talent and encourage them in their cricketing journey. We believe that Mayank has all the qualities to become the next big thing in Indian cricket. We wish him all the very best and welcome him to the CEAT family.